Greetings and good will to all! 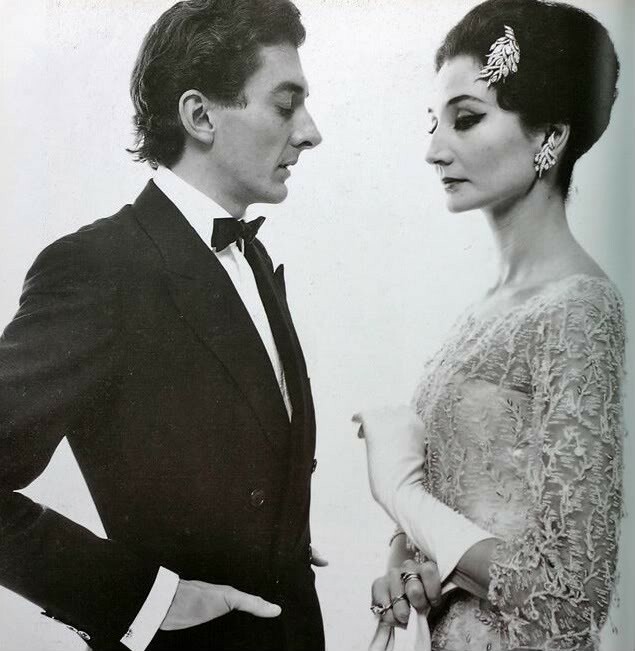 Pleasantly sipping champagne with a drop of cassis, my nose pressed (not literally) against the computer screen while my brother brushes my hair (literally) and I venture out on posting today's blog post on the subject of Jacqueline de Ribes. Having spent a day dressed entirely in a black turtleneck, floor length black skirt and black jacket in the middle of July, the weather is starting to depress me. I can not but think sadly of all the lovely summery clothes I could be wearing right now. My sister, of course, refuses to let the bad weather get her down, clad in tight shorts and one of my red shirts. Maybe I should take this stand, "Weather - I shall not be defeated!" but I do so detest being cold. The very british grit (grit on which they built their empire, stiff upper lip and all that) or optimism of having picnics in the rain, while teenage girls travel around with sunglasses and shorts, cannot transfer to my french half. 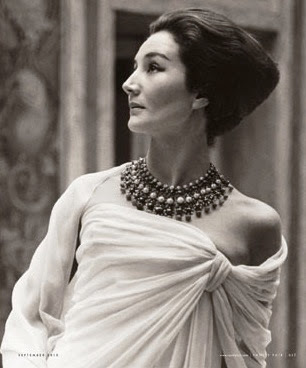 Jacqueline de Ribes - Comtesse, Socialite, Icon of impeccable French chic, member of the International Best Dressed list since 1962 and eventually designer. She was born in an atmosphere of aristocratic wealth and privilege on the 140th anniversary of Bastille Day, the 14th of July 1929 (Making today the day of her 83rd Birthday) to the Comte and Comtesse de Beaumont. She spent most of early childhood residing with her maternal grandfather, and described him as being 'the only one who loved me' devastated by his death in 1939. During the Occupation of France, Jacqueline and her siblings were sent to Hendaye with their Scottish nanny, who was soon after locked up in a labour camp, she being British national. She and her siblings lived parentless with a guardian in the concierge’s cottage at Hendaye after the Gestapo had requisitioned the main house, where her former bedroom was used as a tortured chamber. When Jacqueline was thirteen, she was moved by her parents to the château of the Count and Countess Solages, in the centre of France, where she shared the chateau with german officers,. This is where she stayed until the liberation. Jacqueline was then sent to the convent of Les Oiseaux, in Verneuil, where she took a key part in the school dramatic productions, making costumes. In 1947, she was taken by her uncle to meet Christian Dior shortly after he opened his couture house. Later she studied architecture. In 1948, she married Edouard, Vicomte de Ribes who later became Comte de Ribes, and whom she had two children with. By the age of twenty-five, and having worn haute couture most of her life, she was appearing on all the lists of best-dressed women of the time. "A cross between a Russian Princess and a girl of les Folies Bergère." 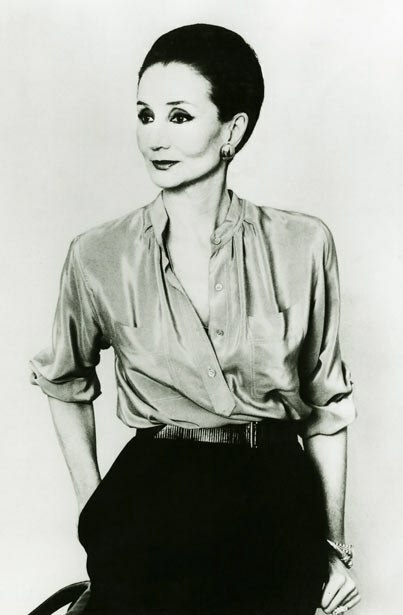 Her beauty and sense of style catapulted her into the limelight and all through the 1960s and 70s, de Ribes cultivated her image of a elegant clotheshorse. By the 1950s, she played a key role in Parisian High Society, and was one of the invited to Carolos de Beistegui's 1951 Bal du Siècle, or Bal Oriental, still considered the party of the century, where the guestlist included Cecil Beaton, Orson Welles, Natalia Pavlovna Paley (of Romanov Royalty, a socialite who later pursued acting) Leonor Fini and many others, this being just an example. 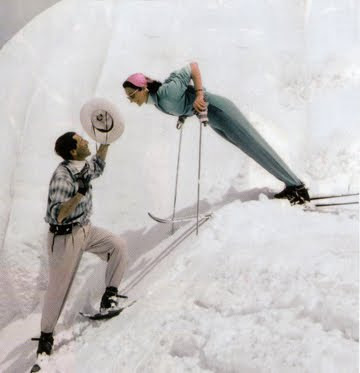 Christian Dior and Salvador Dali designed each others costumes for the event, which helped to launch the career of Pierre Cardin. On a side note, I could not invent the lavishness of this ball - Photos taken by Cecil Beaton of this event are almost surreal, harkening back to an 18th century venetian high society. Sincerely worth studying, and mouth-wateringly delicious. In 1957, she was an invited to Alexis von Rosenberg-Rédé's 'Bal des Têtes'. 1965, the 'My Fair Lady' Ball. 1966, Truman Capote's 'Black and White Ball'. In 1968, The Patiño Ball. Again in 1968, 'La Dolce Vita Ball'. The 1969, 'Oriental Ball', and the 1971, 'Proust Ball'. 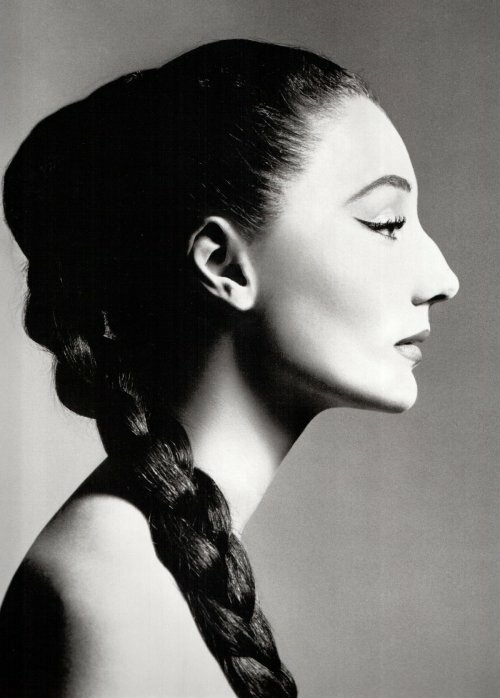 She has been the muse of many designers such as Valentino, Yves Saint Laurent and Guy Laroche, being a stunningly beautiful woman, often paralleled with the egyptain queen Nefertiti. Jean Paul Gaultier dedicated his Spring/Summer 1999 collection to her. She was interested in designing, making suggestions to the couturiers who dressed her, bringing sketches, making changes, and considered Coco Chanel one of her heroes... though, because she never hesitated to change a sleeve, add feathers or otherwise alter a dress she fancied, she never wore Chanel, who would not let the slightest element of her designs be changed. Her upbringing did not encourage women of her class to work, though she would be far from the first socialite to turn her hand to fashion. Warmly encouraged by Italian designer Valentino, de Ribes took the plunge with her first collection shown in 1983, though her friend Yves Saint Laurent was arguably less enthusiastic, calling her 'crazy'. Fashion in one guise or another had always been part of her life. As a child she recalled sneaking into her grandmother's fittings when the dressmaker came to call. As a willowy, tall teenager she cut her first ball gown on the floor of her mother's sitting room. 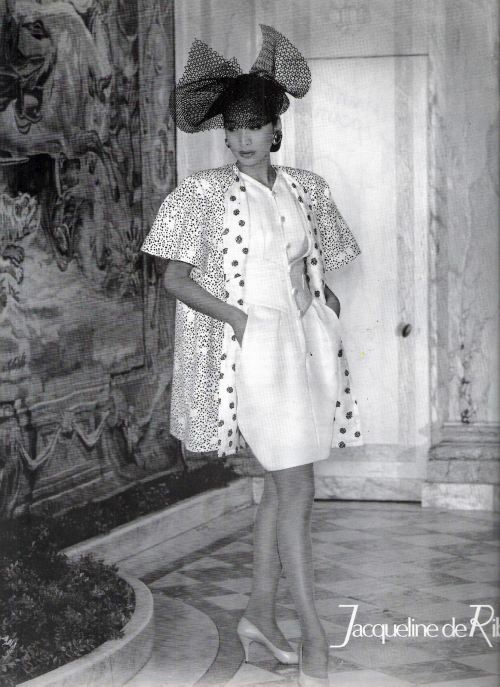 Her first collection was shown in Paris and New York in 1983. Her aura of glamour, grandeur and good taste ensured that her gowns were admired. She designed what she new best - Long, slim evening gowns with shoulder dramatic ruffles, drapes, or simple bows. Tailored suits detailed with black velvet... expensive ready-to-wear, each suit or gown priced at thousands of pounds. De Ribes was designing for herself, consistent with her emphasis on color and line, designing plain, almost severe, dinner suits in bright pastel satins. Lace found an eye-catching use in a slim black de Ribes gown featuring a V-shaped bodice and side insertions of see-through fabric. 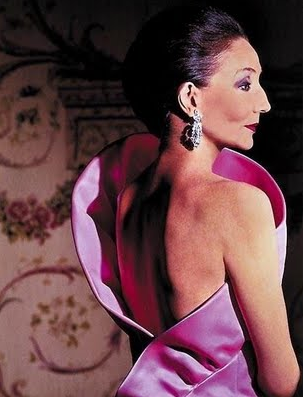 By 1990, de Ribes had softened her look, her evening gowns began to be made of gathered, draped bodices and yards of sherbet-hued chiffon. The next year, she introduced above-the-knee cocktail dresses, with seductive side draping or layered organza. Her collections were quite a commercial and critical hit, though as the then publisher of Women’s Wear Daily, commented “Everybody was prepared to ridicule the society lady making fashion." She retired from designing in 1994 for health reasons, after dreadful back pains which left her in hospital and unable to walk for three years. In April 2010 the French President Nicolas Sarkozy decorated her as a Chevalier of the Légion d'honneur at the Elysée Palace. Une femme magnifique et d'une élégance rare. une allure unique. J'ai toujours admiré cette femme et son parcours. Wow what an amazing post, incredibly creative and knowledgeable...fantastic! Hey there! Love your great blog! I just added myself to your followers for support and wanted to invite you to come follow back maybe and enter a fabulous I'm having right now!! Amazing entry. THe pictures are amazing too! This woman is one of the most elgeant women's in the world. Thank you for your comment. Love this post, she is so elegant. I'm following now.